Last year when Dodge formally announced the new Viper ACR – the most track-focused street legal version of the manufacturer’s sports car – expectations were high. But could it complete with this new crop of seven-figure, nearly 1000 horsepower hypercars from Ferrari, McLaren and Porsche, especially since SRT engineers had chosen leave the 645 horsepower V10 and six-speed manual gearbox alone? It took six months to find out, but the wait was worth it. With SRT engineer Chris Winkler behind the wheel, the ACR (which stands for American Club Racer) started by beating the production car lap record at Inde Motorsport Ranch in Arizona. Then they headed to Buttonwillow Raceway Park and beat the production car record there. Then they did the same thing at Willow Springs. And VIR. And Road Atlanta. 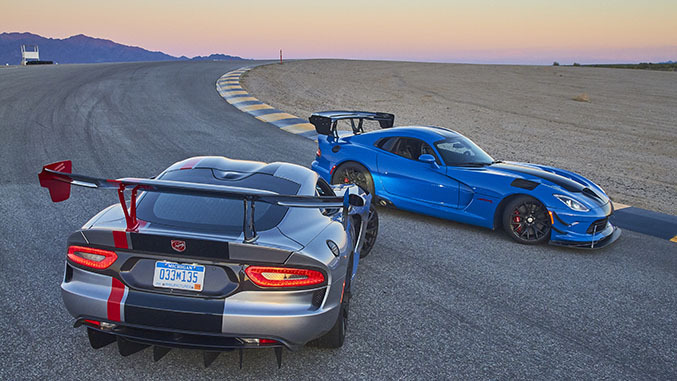 By the time that Dodge made an official announcement about the Viper ACR’s trophy collection, they’d racked up thirteen production car lap records across the country. So when the folks from SRT asked me if we wanted to take the car for a spin around Chuckwalla Valley Raceway during the a Viper Tracks event – a Viper owner’s club-organized weekend at the track – it didn’t take much convincing to get us out the door and on the road to Palm Springs. Viper Tracks is a grassroots effort conceived by owners looking to bring both a sense of community to the Viper fraternity and provide an event tailor-made for the car. The program caught the attention of Dodge, who stepped in to provide additional support for the annual event. From classroom instruction for drivers at all skill levels by pro racers who’ve piloted the Viper for Dodge’s factory team and Q&A sessions with SRT engineers (including Chris Winkler), to a full autocross course, and the Viper ACR models on hand for media drives (along with a number of Hellcat models for both lead/follow lapping and autocross duty), Dodge and SRT’s role in the event elevates this celebration of the iconic sports car far beyond your typical car club track day. SRT engineers might’ve chosen to leave V10 from the standard Viper alone when developing the ACR, but that doesn’t mean this is some kind of wannabe sticker-and-wheel package. The ACR features a wild new aerodynamics package that boasts more downforce than any production car ever made. It’s achieved by way of a massive dual-element rear wing, rear carbon fiber diffuser, a unique SRT hood with removable louvers, a detachable extension for the front splitter and four dive planes. The ACR also gets some serious stopping power from a new carbon ceramic Brembo brake system, which utilizes the most brake pad area ever offered on a Viper. It also benefits from specially tuned stability control and ABS systems to get the most out of the new brake package. Also unique to the ACR is a ten-way adjustable Bilstein coilover suspension system, as well as the ACR’s secret weapon: A set of Kumho Ecsta V720 high performance tires that have been designed specifically for the ACR, which may be the best street legal tires you can get right now. In terms of sports car prowess, the ACR improves upon the standard Viper in nearly every way measurable – it’s faster in a straight line, it stops harder, and corners with even more confidence. But what’s truly remarkable about the ACR is how approachable it is, even for relative novices. A sizable chunk of the credit should go to Kumho for making a seriously incredible street car tire – the grip is simply relentless.